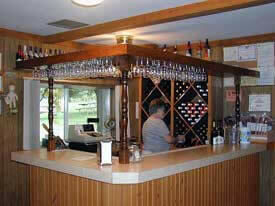 Kirk and Carol Grass became owners of the Bias Winery, a small, family-owned winery, in June of 2004. Theirs is a story of a passion that evolved into a career. They had moved from St. Louis to New Haven Missouri in 1991 and a friend took them on a tour of the area wineries. They saw the Bias Winery sign and fell in love with the property. It was a place they could unwind and relax and enjoy Jubilee Red, Carol’s favorite wine. Jubilee Red continues to be one of the best-selling wines at Bias Winery, but the most popular these days is Strawberry Weisser Fleider. The Grasses are committed to preserving the wine making traditions started by the winery founder, Jim Bias. Stop in and sample the wines being produced from grapes off their vines … their vineyard is just 600 feet from their winery! Don’t miss their calendar of events posted on the Bias Winery website … including Oktoberfest each weekend in October 2010. The winery is open 7 days a week (excluding Easter, Thanksgiving, Christmas, and New Years), see their website for details hours. They are located just 7 miles east of Hermann, Missouri. When planning your tour through the Missouri Wineries, make Hermann Hill Bed &Breakfast and Vineyard Inn your lodging choice!